I am sitting by the pool looking on a perfectly sculpted lawn. There are palm trees and vines along the very high fence and gates as if to camouflage the fact that I am protected – hemmed in from the outside world. This is a little Eden. The South African writer, Justin Cartwright, says to me ‘I bet when they told you, you were coming to Africa you didn’t expect this.’ I look again at this display of wealth – this property that could just as easily be in Norbrook Jamaica, or Cherry Gardens. And I think, actually, this *is* what I had expected. On the outside of the property is another familiar sign, literally. The beaugeanvillia flowers spill over and almost cover the yellow and black letters that declare this property is protected by a security firm. In fact, every house on the street has such a sign on their electric gates making it seem (unfortunate pun aside) that such firms are also making a killing in South Africa. 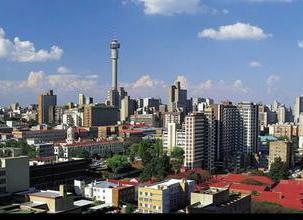 Downtown Joburg is of course a whole other world. Even Anika, my South African guide, is a little tense as we drive through the streets in a carefully locked and air-conditioned BMW. The day before we had driven through a lion enclosure and everyone was noticeably calmer as those beautiful large brown cats trotted by the car and roared. Downtown Joburg, however, is a more dangerous kind of safari. The city bustles with both life and anger. And if you don’t know the rules, your life could be in danger. In fact, if you know the rules, your life is still in danger. Always in this city there is a feeling that something could explode. At the traffic lights in Johannesburg the most amazing things are sold – electric cords, and phone chargers, and bracelets. I don’t bother to say that this too is familiar. Anika tells me that there was recently another writer visiting who noticed the most arbitrary thing being sold at one of these intersections – an atlas of the body. And then she thought, but this is exactly what I need! I need to know where the pancreas and the liver and the kidney are, and so she bought it. I ask if, at night, the traffic lights are obeyed? If they do not merely become suggestions. Anika nods furiously. Of course they are only suggestions after 10 o clock. Drivers only slow down to make sure nothing is coming – but you don’t actually stop. That would be stupid. And I ask if she is aware of how aware she is in South Africa. Perhaps without even trying to be – we just know every car that is driving behind us, how long they have been there, and we do not turn into our houses if a strange car has been following for more than a few minutes. You stand at a corner, and you know who is approaching, you note their walk, and their every gesture. Yes, she tells me. We are all so aware in South Africa. And then we are parking the car and two men are giving very obvious directions to turn, to lock the wheel, to straighten out. When we leave the car there is a small exchange though I don’t know the words because much of it is in Zulu. Anika begins to explain to me after but instead I stab a guess: they offered to look after the car while you were gone, and also, they suggested that they could give it a wash. South Africa – and Joburg in particular – it turns out, is a very familiar place.